Prove they are "THE BEST"
Sunday 10th February was yet another important day for the Fighters Squad of the Welsh Academy of Martial Arts/YMCA Kickboxing Club. Yet Again, 10 W.A.M.A. students qualified to represent Wales in the World Championships to be held in Italy this year. 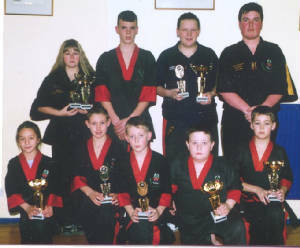 Students of WAMA/YMCA Kickboxing Club, took part in the Welsh Championships held by the World Kickboxing Association on the 10th February this year and again walked away with a clutch of trophies. 1st 2nd and 3rd places. Missing from picture are Nathan Robinson, Marc Harris and Lauren Allen. Natasha, Tara, Sonny and Lauren were part of the 2001 qualifying team together with Rhydian Tolcher-James. Lauren returned as Silver Medallist and Natasha and Rhydian both returned as Bronze Medallists. Due to a back injury Rhydian was unable to take part in the qualifiying round for this year. All participants told the News We would not have achieved this level without the expertise of Lynne Tolcher-James, instructors and our sponsors for last year, without whose help we would never have been able to represent Wales at the World Championships held in Austria. We would be extremely grateful if you would please consider also sponsoring us for this year. Sadness reigned upon the students of the Welsh Academy of Martial Arts, when they were told that they would not be able to attend the World Championships in Italy this year due to the lack of funding. Its a sad time when we have to beg for financial support for our talented children to represent their country in prestigious events throughout the world. These children were devasated when we were unable to raise the funds for them to enter into this prestigious event. If however, there is someone out there who is able to help us, PLEASE PLEASE make contact.